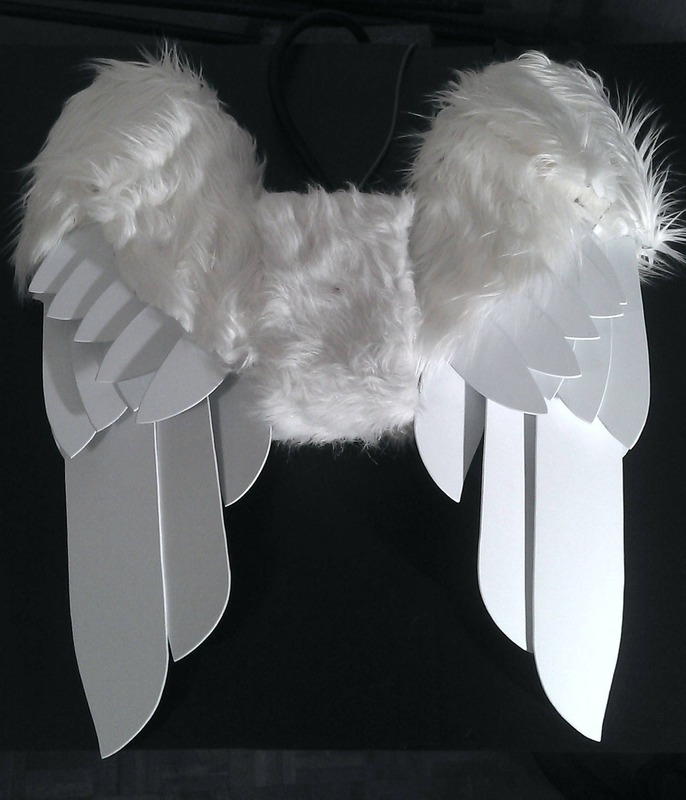 Bionic Concepts - Backpack style realistic Angel Wings! Opens to 7 feet wide at the flick of a switch! Closes to 28 inches. Comes with contoured backpack for comfortable use. Wings weigh approximately 23 lbs and are powered by 16 gram threaded CO2 cartridges; a standard CO2 cartridge size available worldwide. 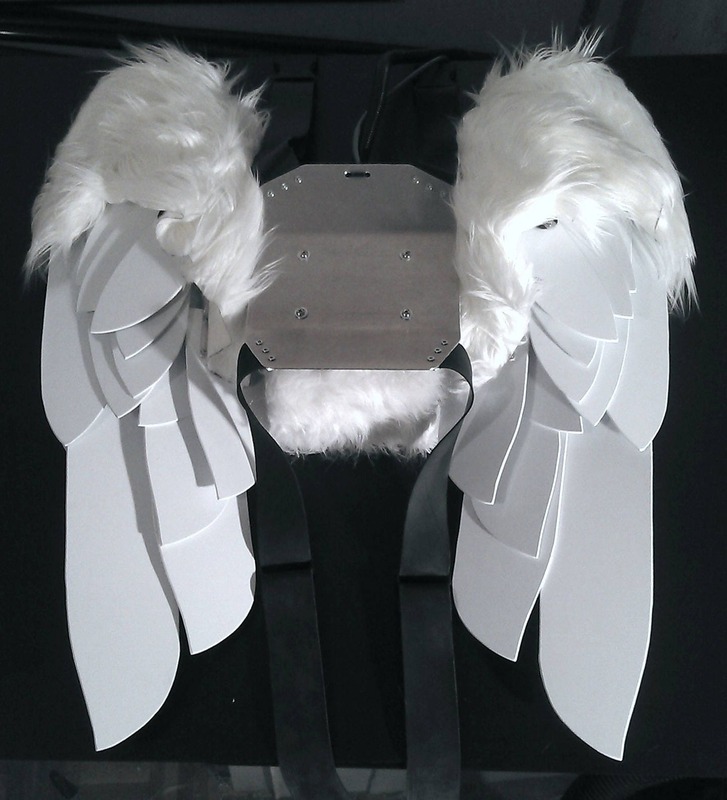 Wings are connected by 2 inch wide black leather straps and adjustable heavy duty snap on connectors. Available in black or white. Due to color availability of suitable thickness of lightweight and strong plastics for the feathers black will cost slightly more than white. Select color from options menu. Also available with foam padding and extra wide deluxe contoured rubber shoulder pads. This option is helpful if the wings need to be worn for a long time. Select padding option from the options menu. 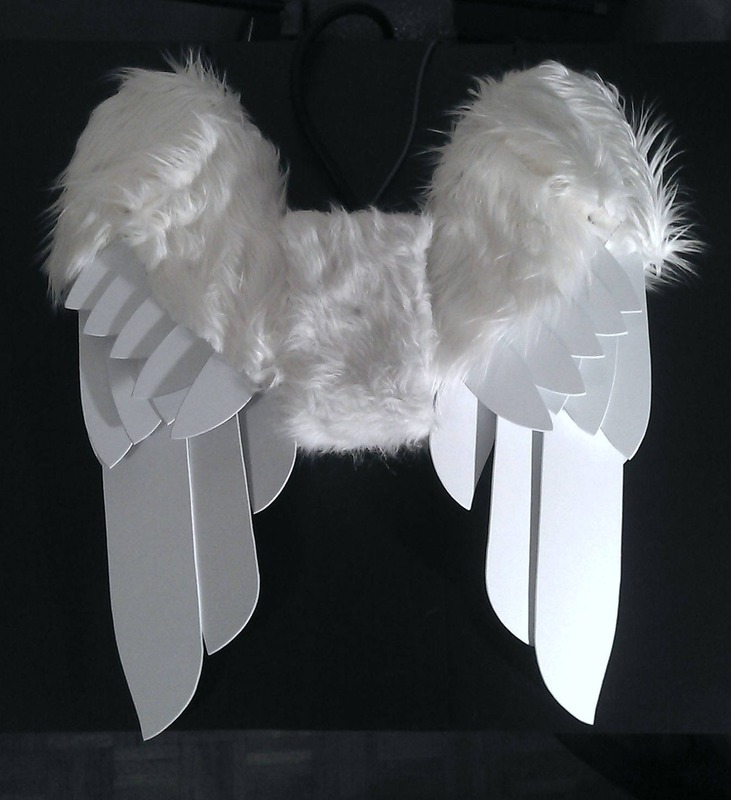 The angel wings are controlled by a hand held control pad. This control pad is used to open and close the wings and is connected to the wings by a line about 20 inches long which goes over your shoulder. The wings are powered by 16 gram threaded CO2 cartridges. These cartridges screw into a custom made miniature CO2. The miniature regulator is connected to the wings by a separate line about 30 inches long (long enough to keep the CO2 power source in your pocket). Simply screw in a disposable CO2 cartridge and you are good to go. Each cartridge allows you to open or close these wings about 10 times. CO2 cartridges can be bought online or from local bicycle stores where they are commonly used for tire inflation. Look for "16 Gram Threaded CO2 Cartridges" CO2 cartridges are one time use only, once you have screwed a cartridge into the regulator DO NOT disconnect it until it has been fully depleted. Mini regulator dimensions are 3 inches long by 1 inch wide without CO2 cartridge attached, and 6 inches long by 1 inch wide with CO2 cartridge attached. Wings will take 2-5 weeks for construction and under a week for delivery to most locations. Note: Due to the very large size of the package some international delivery charges may be greater than specified here. Also some locations may not have delivery available for such large packages. Contact us for details.